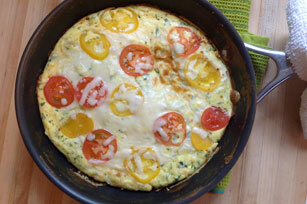 Make this easy-to-prepare frittata recipe when you only have a few ingredients on hand. The secret ingredient here is the dressing, which flavours the frittata with Parmesan and basil. Our Cheesy Tomato Frittata is the perfect recipe to serve as part of your breakfast, lunch or dinner. Heat ovenproof skillet sprayed with cooking spray on medium heat. Meanwhile, whisk eggs and dressing in medium bowl until blended. Stir in parsley and half the cheese. Pour into skillet; cook 3 to 4 min. or until egg mixture is almost set, stirring occasionally. Top with remaining cheese and tomatoes. Bake 12 min. or until frittata is puffed and cheese is melted. Substitute chopped green onions or chives for the parsley. If serving as part of a breakfast, serve with croissants and a cold glass of fresh fruit juice. Or, if serving as part of a lunch or dinner, serve with a tossed green salad and crusty baguette.